Everyone’s talking about LakePark at Tradition. But don’t take their word for it. You’ve got to experience these stunning master-planned communities for yourself. 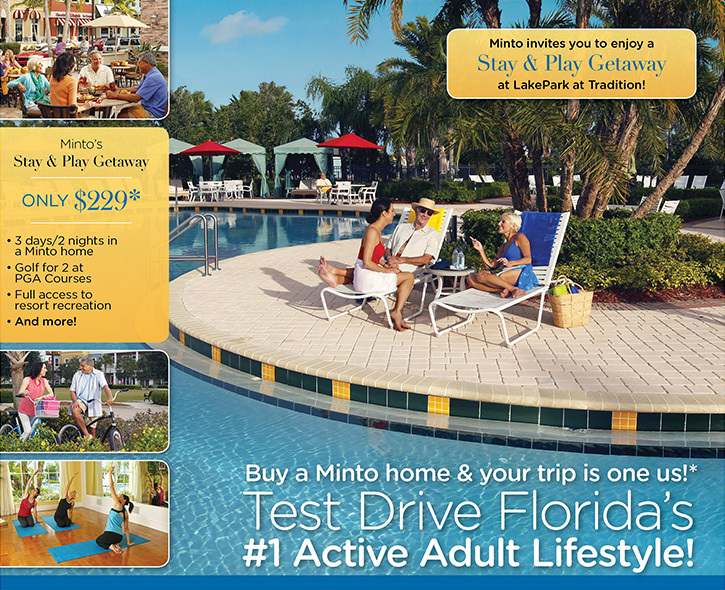 Minto makes it easy with the Stay & Play Getaway. Enjoy a rousing game of tennis, bocce, pickleball or horseshoe on the outdoor courts. Relax along the resort-style swimming pool, heated year round. Meditate in the Club’s yoga studio or start your day with an energetic workout in the state-of-the-art fitness center. Plus, you’ll stay in a beautifully furnished Minto home, so you’ll see first-hand the innovative design, quality construction and included premium features of these impressive residences. Priced at only $229*, you can’t afford to miss this opportunity to preview the Florida retirement dream as an honorary resident of LakePark. This is a limited-time opportunity, so call today to reserve your Stay & Play Getaway! *Price excludes taxes. Costs of trip including airfare and expenses will be reimbursed up to $500 after the buyer closes on a Minto home. Purchase must be made within 90 days of stay and play visit. Receipts for airfare and expenses must be submitted in order to be reimbursed for exact expenditures. The reimbursement cost is not to exceed $500. © Minto Communities, LLC 2017. All rights reserved. Content may not be reproduced, copied, altered, distributed, stored or transferred in any form or by any means without express written permission Artist’s renderings, dimensions, specifications, prices and features are approximate and subject to change without notice. Minto, the Minto logo, LakePark and the LakePark at Tradition logo are trademarks of Minto Communities, LLC and/or its affiliates. CGC 1519880.